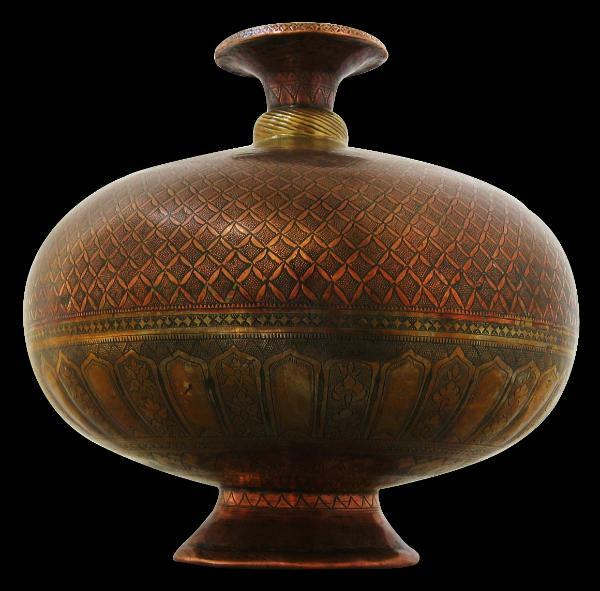 The large, bulbous vase was made to store holy water from the Ganges. 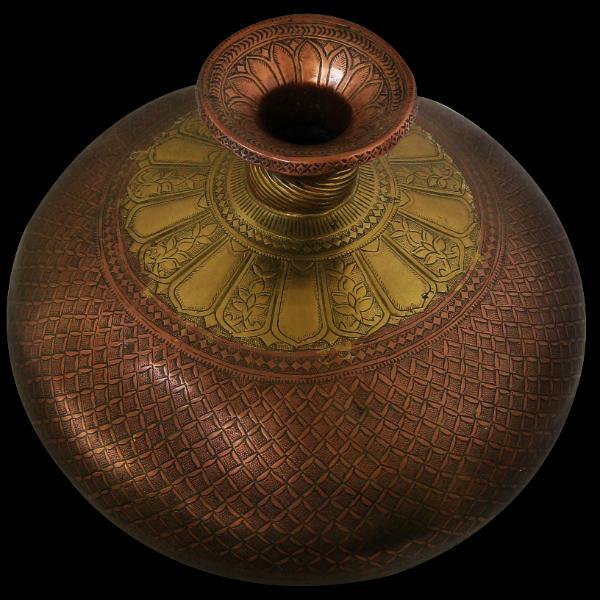 Pilgrims would buy such a vessel in Benares or one of the other similar holy cities along the Ganges, fill it themselves with Ganges water and then store the water in it thereafter. The mouth is engraved with lotus petals. The shoulder is too, with alternate petals engraved with flowers. 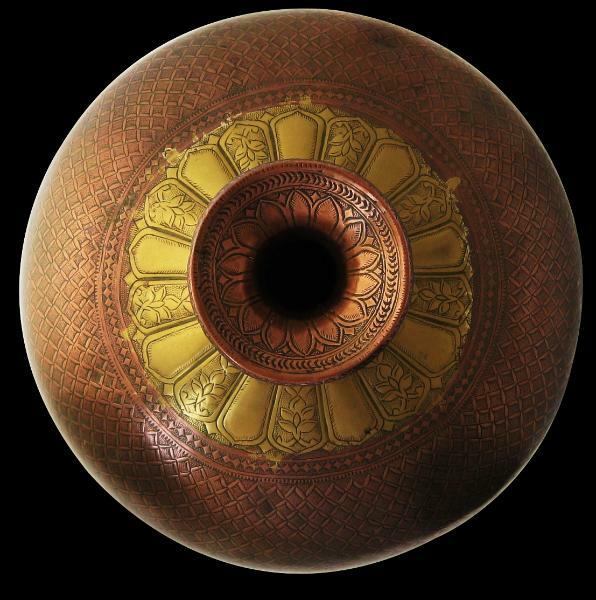 The top part of the body is engraved with elaborate trellis of cross-hatching. The bottom part has another border of lotus petals with each alternate one engraved with flowers. The underside of the base has another border of repeated flower motifs, followed by a final border of closely engraved lotus petals. The small, slightly flared foot is largely unadorned. 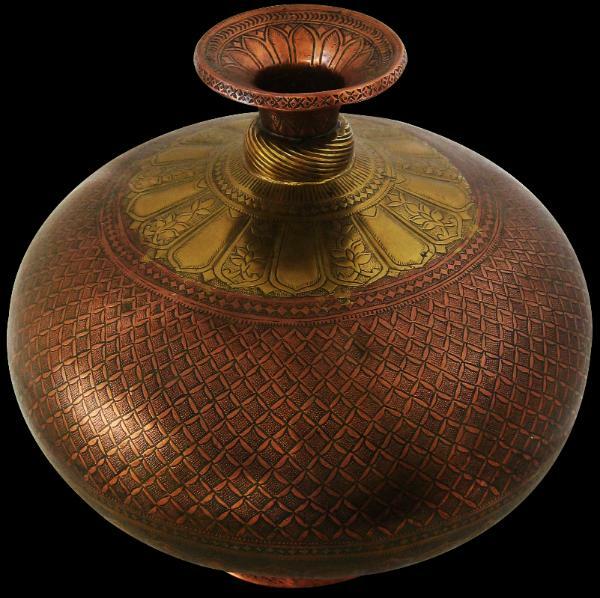 ganga-jumna metalware. Ganga refers to the River Ganges and Jumna refers to the River Jumna. 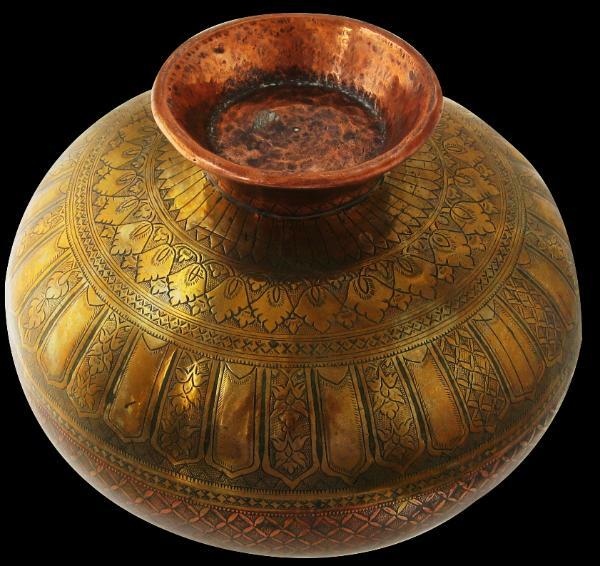 The water of one has a slight yellow hue on account of he alluvial mud suspended in its waters whilst the other has a reddish hue, hence the mixing of reddish copper and yellowish brass. lota is very good, particularly given its unusual size. There is minor denting here and there but no splits or repairs. Zebrowski, M., Gold, Silver & Bronze from Mughal India, Alexandria Press, 1997, p. 213. For a similar piece see Harle J.C., and A. Topsfield, Indian Art in the Ashmolean Museum, Ashmolean Museum, 1987, p. 65. View of the under-side of the lota. Click on the video to see the relative size of this item.